Got a Keris book for my b-day! 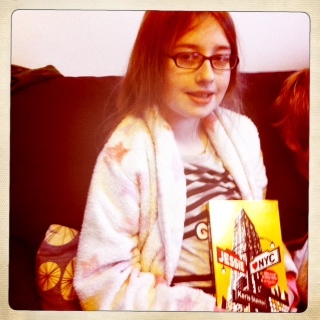 For my birthday last December Jae gave me the gift of Jessie Hearts NYC by Keris Stainton. Well she is twitter buddies with the author. A few of my friends had read it too so I gathered some questions and Jae emailed Keris. Here is our awesome interview with the author. Wow, what a question! Thank you! Well, I don’t think I am, I think I’m very ordinary almost all of the time. What inspired you to write Jessie Hearts NYC? The main inspiration was New York. I absolutely love the place and really wanted to set a book there. And then I was listening to a song called If It Kills Me by Jason Mraz – it’s about a boy who’s in love with his best friend’s girlfriend and I really loved that idea. And then Finn just popped into my head, wearing a tux, holding a bunch of red roses and trying to flag down a cab in Times Square. Do any of your books relate to your life? There are always little things I take from real life. Della’s dad, (from her first book Della Says OMG!) for instance, is quite a lot like my dad – he used to sing “A pretty girl is like a melody” when we were going out – but he didn’t have a deli and my mum wasn’t a model. I went to The View revolving restaurant in New York and did actually get confused about the bathrooms like Jessie does. The next book after Emma is set in Italy and that one probably relates to my life the closest, because the main character’s dad has just died and I wrote it not longer after my dad died, but everything else in that book is made up. 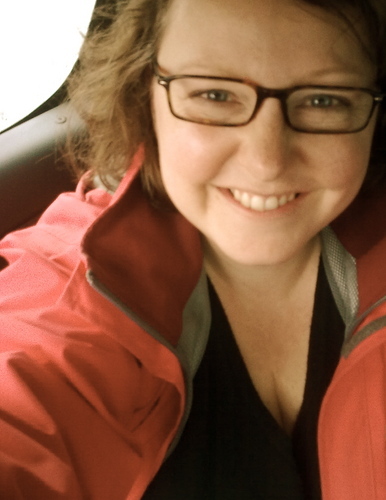 Pleased to meet you, Keris Stainton! I always really loved writing, but for some reason I never thought about being a writer. Actually, I did want to be a journalist, but I never thought of writing a novel. And then one day, when I was about 25, it just popped into my head – “I should write a novel!” – and once I thought of it, I couldn’t believe it hadn’t occurred to me sooner! I started trying to write one straight away, but it was rubbish. In fact, I think it took another eight years for me to finish a book I was happy with. Luckily that book got me my agent and publisher! What was your favourite book when you were 12 and can you recommend some for us? When I was 12, I was obsessed with these teen romances called Sweet Dreams books. You can read all about them here. I don’t think I’d be writing the books I write now if I hadn’t read so many Sweet Dreams books. I wouldn’t exactly recommend them (I’ve reread a few recently and they’re a bit rubbish) but my favourite was Thinking of You by Jeanette Nobile. There’s so much fantastic YA fiction out now – teens are so lucky. My favourites are Split By a Kiss by Luisa Plaja, Girl Meets Cake by Susie Day, Fly on the Wall by E Lockhart, The Princess Diaries series by Meg Cabot and A Bad Boy Can Be Good for a Girl by Tanya Lee Stone, which is written in verse, but you shouldn’t let that put you off because you stop noticing and it’s just wonderful. I really enjoyed reading this book! It’s all about this girl called Jessie who goes to visit her mother in New York with her best friend and a New Yorker called Finn who’s in love with his best friend’s girl friend. I loved hearing about NY because it’s a place I would love to visit. All in all it’s a very good book that I would recommend. There was nothing wrong with the book, I couldn’t fault it. It’s perfect in every way and a cracking good read!!! February 9, 2012. Tags: books, keris stainton. Reviews, Stuff we love. 2 comments.